I had made this back in December for a Create with Connie and Mary Thursday Challenge and then decided to make a different card for it. I thought I’d share it now since many are starting to think about Valentine’s Day. This features the products in the Whole Lot of Love Collection. 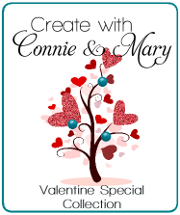 In case you missed it, you can still sign up for the Create with Connie and Mary Valentine Special Collection! You can’t purchase the kits, but you can still join for the ideas! Cut out Crumb Cake heart, add Brown Sugar Ruffled Ribbon around heart and add to card front using dimensionals. 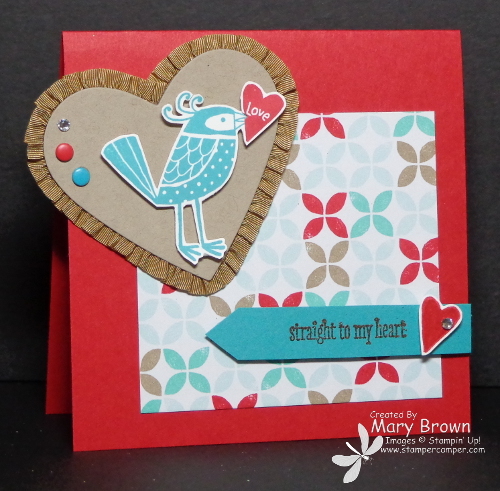 Stamp bird using Bermuda Bay and cut out..add to heart using dimensionals. Stamp heart in Real Red, cut out and add. Add Bermuda Bay and Real Red Candy Dots and a Basic Rhinestone onto the heart. Stamp the greeting using versamark on Bermuda Bay, emboss using Early Espresso embossing powder, cut into a flag and add using dimensionals. Stamp the heart again in Real Red…then color in over the letters. Cut out and add using dimensionals. Add a basic Rhinestone to finish it off. And speaking of Valentine’s Create with Connie and Mary is so excited to offer a Valentine Special Collection featuring the stamps and products from the Whole Lot of Love Collection! This MINI collection features FOUR tutorials – 2 cards sets and 2 3D projects for only $5.95! This entry was posted in Create with Connie and Mary and tagged Love You More. Bookmark the permalink.